How do you unravel a knot? If it’s just some weird loops, I’ll loosen up the string/rope, try to find one of the ends, then fight my way through to unravel the chaos. Decluttering has the same process: clear out the biggest areas first, find an area where you can maintain some order, then unravel the chaos. The final step would be preventing those knots, or cluttering items, from reappearing. Is it just continual maintenance? The actual last step is figuring out if it was even worth the time to maintain. It took about three minutes to unravel. That was three minutes I could have spent doing anything else, but I decided that it was worth bringing this rope along with me to my next residence in either the office or automotive section, but why? There is generally always a use for something like this, but then there gets to be a point where owning this object is like a knot in my mind: when would I need it? Was the potential value of it worth the three minutes I spent with it? It was a nice decluttering exercise. …were it not a dumping ground for clutter. For me, clutter feels more comfortable than cleanliness. That’s a mental knot that needs time to unravel. It might be because there’s a certain convenience in clutter: if you don’t know what to do with something and are disinterested in it, you can place it in a general direction and call it good. I must admit that in order to clear off the table, I did place objects of once-clutter into certain areas: a random assortment of pens and pencils in one area, office supplies in a cluttered drawer, but at least I did throw away everything with little potential value. Rather than just leave the rope in a state where it could become clutter again, I twist-tied it twice and bagged it, and it actually went in with the clutter of tools. Just like with space that I’ve cleared up, rather than leave the space open for clutter to return, I’ve closed off those areas, either by filling them in with the next objects to sort, or getting rid of that space entirely. By removing those temptation areas, the restricted space forces me to address the next section conclusively. Rather than just spread around the clutter, it’s a process of unknotting that block. Inspirations: I thought of the analogy and the idea for this essay while I was unknotting this rope. 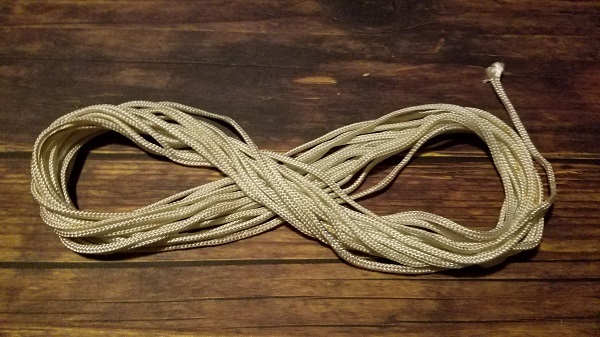 The infinity-symbol shape is how I wrap up long cables, and it works out well enough. I thought it looked good for imagery. I wasn’t really feeling like writing but something about the idea compelled me, and I think it’s me trying to figure out why I am drawn to clutter in the first place.